FXstreet.com twice in the media this week! FXstreet.com has been featured in the media this week… twice! 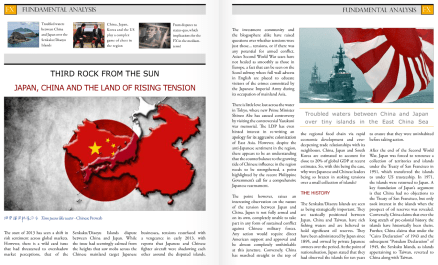 First, in the April-June edition of the FX Trader Magazine, where Gus Farrow’s article “Third rock from the sun: Japan, China and the land of rising tension” was published . The article was originally published on our website. You can download the PDF version of the article in the FX Trader Magazine or read it in the magazine, page 12, in the Flip-page edition or iPad and iPhone version. FX Trader Magazine is a quarterly publication that provides currency traders with news, analysis, education and forecasts from the market experts. It is distributed to private investors, money managers, institutional FX brokers, introducing brokers, Foreign Exchange desks and FX market participants worldwide. Second, Gus Farrow – him again!- was quoted in an article published yesterday, March 8th, in La Vanguardia, Catalonia’s leading daily newspaper, printed in Spanish and in Catalan. The newspaper has Spain’s fourth-highest circulation among general-interest newspapers, trailing only the three main Madrid dailies — El País, El Mundo and ABC. The article is about Bitcoins, a new currency that is much commented lately in the media. You can download the pdf version of the article, which is also published on the digital version of the Catalan newspaper, but only for those who have a suscription for it for the moment. In one month, it will be available for everyone.